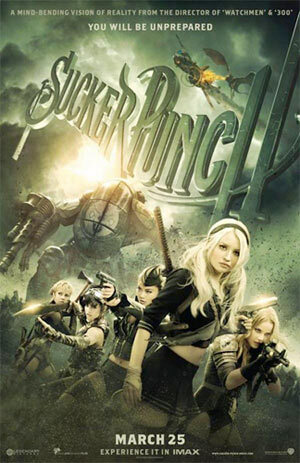 Set in the 1950s, SuckerPunch follows Babydoll (Emily Browning) who is confined to a mental institution by her stepfather, who intends to have her lobotomized in five days. While there, she imagines an alternative reality to hide her from the pain, and in that world, she begins planning her escape, needing to steal five objects to help get her out before she is deflowered by a vile man. Regardless, at least the women in this story are trying to take control of their lives — even if they do it wearing Sailor Moon outfits. And there are katanas. And mecha suits. Did I mention there were katanas? I plan on seeing this as well, although I share some of the same concerns as you. I hope I’m more excited about the plot once I’m actually seeing the film vs. my response to the trailer. It seemed kind of underdeveloped. Might be a case of style over substance. But because it’s Zack Snyder’s baby, I will risk the journey.